On behalf of the Xia-Gibbs Society, we’d like to thank you again for your support! It is greatly appreciated and, as we hope you’ll see from this newsletter, you have helped the Society get up and running and begin our important work. As a reminder, Xia-Gibbs Society, Inc. is a not-for-profit corporation formed in the USA for charitable purposes. The Society is here to support and advocate for those with Xia-Gibbs Syndrome (XGS) and their families, to raise awareness and to assist with scientific and medical research. My daughter, Molly, was diagnosed with Xia-Gibbs (pronounced "Sha"-Gibbs) syndrome in 2013, when she was 18 months old. This is when the syndrome was discovered. 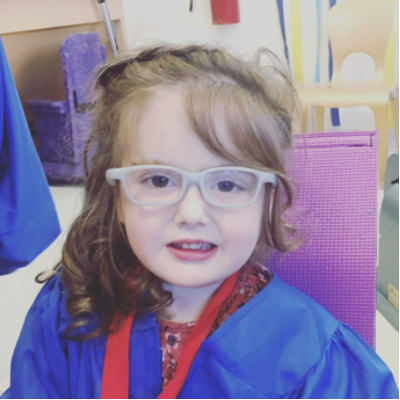 Molly, who is now six years old, was the first of four children known to have Xia-Gibbs Syndrome, which was discovered by my uncle, Molly’s great uncle, Dr. Richard Gibbs, and his team of researchers at Baylor College of Medicine in Houston. The story starts earlier though, in September 2012, when my mother called her brother, Dr Richard Gibbs, because she was worried about Molly who was just four and a half months of age. Molly was in hospital due to a respiratory infection, made more dangerous by her breathing problems and poor muscle tone. Of course, back then, we didn’t know the underlying cause of these difficulties. Richard suggested we send blood samples for Molly and from us to his lab in Houston. So, with the help of the Royal Children’s Hospital in Melbourne, Australia, we did. This, and months of work for scientists in the lab at Baylor College of Medicine, carefully examining the exome testing results, ultimately lead to the discovery of Xia-Gibbs Syndrome! Despite how recently Xia-Gibbs syndrome was discovered, nearly 100 people have already been diagnosed worldwide, through a cutting edge technique known as Whole Exome Sequencing. This genetic testing technique was pioneered by the Baylor College of Medicine Human Genome Sequencing Center in Houston. There are thought to be many more people out in the world who have XGS who are still un-diagnosed. Not having a diagnosis is incredibly difficult for people and their families, who have to carry on without knowing the cause of their symptoms, often for years. Recently, we met the oldest person known to have the syndrome, Kevin, who was diagnosed at 56 years of age. He has lived nearly his whole life without knowing the cause of his symptoms, and now he and his brother and sister finally have some answers. Apart from Kevin, nearly all of the people who have been diagnosed so far are children or young adults. We now know that Xia-Gibbs Syndrome is a neuro-developmental disorder that originates in the brain, causing physical and intellectual disability. Many people experience breathing difficulties, including sleep apnea and seizures. Many also meet criteria for autism and most require significant ongoing care. Families often describe their family member with XGS as the light of their lives. We feel the same way about Molly. She is brave, sweet and gives us so much love. She mostly doesn't talk yet, but she has a lot to say. If you know someone with XGS, you may be able to relate to this! We are still new, but the Society was set up to help raise awareness about Xia-Gibbs Syndrome (so that, for example, more people will be able to receive a diagnosis), and to provide support and advocate for people with the syndrome and their families. We also aim to help fund and promote future scientific research. There is so much we still don’t know about Xia-Gibbs syndrome and the AHDC1 gene responsible, so your support is greatly appreciated! The Xia-Gibbs Society aims to support ongoing research initiatives through direct funding, advocacy and through raising awareness about XGS. As a concrete goal, the Society aims to raise $50,000.00 in the next twelve months in order to establish a Research Fellowship, which would be awarded through a competitive grant process. We ask you to consider helping us reach our goal by making a further donation, however small…every piece of support counts more than you could know! If you are able, we would love you to consider making a regular monthly donation. In May this year, the Society held its 2nd Annual Conference in Houston, Texas. Ten families of those affected by the syndrome attended the conference. They heard presentations from scientists and clinicians at Baylor College of Medicine and Texas Children’s Hospital. The families also attended our first Xia-Gibbs Society, Inc. open board meeting and heard presentations by therapists working with people with XGS. The research team, led by Dr. Richard Gibbs of BCM, shared its findings from research conducted so far into XGS and its clinical presentation. This research resulted from data gathered through the XGS Patient Registry, which was established following the 1st Annual Conference in 2017. The findings were recently published in a paper in which XGS was described for the first time in terms of its clinical presentation. This will help raise awareness and understanding of the syndrome around the world. It will help doctors and family members of undiagnosed persons to move towards an XGS diagnosis and those with an existing diagnosis to access further information and support. Project 1 Xia-Gibbs Syndrome Registry: The goal for the Registry is to collect genetic and other clinical information from XGS families worldwide so we can have a better understanding of the phenotypes of XGS patients. Project 2 Biobank (Blood or other specimen collection from XGS families): The goal is to bank and manage samples that will assist the study of cellular changes that result from AHDC1 mutations. Project 3 Rapid diagnosis of AHDC1 mutations: The goal for this study is to develop a rapid test to detect AHDC1 mutations from saliva samples, to allow quick diagnosis for patients with Xia-Gibbs Syndrome-like clinical symptoms. Project 4 Protein expression: The goal is to purify the AHDC1 protein from different sources to use in functional studies, as well as to enable drug target screening. Project 5 In-vitro functional assay: The goal is to better understand the function of AHDC1 in normal cells and how the mutations can cause disease. Project 6 AHDC1 in the Interactome: The goal is to predict the function of AHDC1 through computational studies. Project 7 Mouse model with AHDC1 mutation: The goal is to better understand the disease mechanism in mice and potentially use this model for drug development. Project 8 Missense AHDC1 mutations: The goal is to better understand the results of mild (ie. non-truncating) mutations in AHDC1. Project 9 Somatic Variation and Mosaicism in AHDC1: The goal is to identify whether there are instances of AHDC1 mosaicism that can influence disease and or recurrence. Project 10 Extent of deletions including AHDC1: The goal is to determine the clinical effects of deleting one copy of AHDC1. Project 11 Therapeutics for AHDC1 Deficiency: Two avenues for future therapeutic studies related to AHDC1 are planned: drugs and genome editing. Other researchers have also shown interest in the syndrome as information about it becomes more widespread. As you can see, there are many avenues for researching and developing our understanding of the syndrome with potentially meaningful practical outcomes for those with XGS and their families. However, while the research so far has made good progress, it is at a very early stage and requires support to continue. Arika Estep regularly updates this blog about caring for her son Emmett, who was diagnosed with Xia-Gibbs Syndrome in December 2014.